These are wide angle views of Buckingham Palace in London, England. 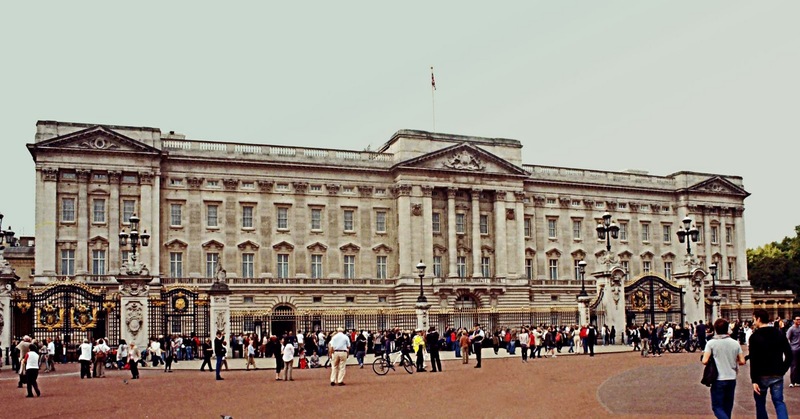 Buckingham Palace is the seat of British Royalty, where the British monarch lives. In these pictures you can see tourists milling around the palace. The first photograph is taken from the point of view of a single male tourist to the left of the picture and gives a view of the whole facade of the building. Three images were stitched into one to get this picture. As many as four gates of the structure are visible in the photo. Another view of Buckingham Palace, slightly closer up. Three gates are visible in the picture.